For the past two months, my column has been reprinting selected reviews of Streamline Pictures theatrical and video releases. Streamline was a company both Jerry Beck and I were heavily invested in during the 1990s. The first five parts of this survey recapped the origins of the company and what it accomplished. I’ve been posting reviews, in alphabetic order, every since. Today’s post looks at one specific film, Twlight Of The Cockroaches, Streamline’s second theatrical release (after Laputa: Castle In The Sky) in 1989. It was also Streamline’s first subtitled release. “Reviews by the Underground Committee: [N.b. : The editor provides copies of videos to a 12-person committee, then writes a composite review combining their individual comments.] ‘In-your-face’ ‘dark and foreboding’ moralistic Japanese film combining animation and live action that drew extreme love-hate reactions. (‘The best animated movie I’ve ever seen — better than Roger Rabbit.’ ‘The slowest-moving piece of caca I’ve ever seen, aimed at about a 13-year-old’s level.’) Most agreed that ‘some subtlety would have greatly enhanced the flick,’ but using cockroaches as the stars of a story about genocide is at least a ‘fascinating exercise.’ A ‘cute’ but ‘whiny’ cockroach community has the run of a bachelor’s apartment — until he gets a new girlfriend, ‘babe’ Setsuko Karasumo, and she goes all out with gas, chemical and mayhem as civilization (roach civilization, that is) is almost, but not quite, wiped out. Meanwhile, a neighboring tribe of Nazi roaches comes over to help in the battle, while a roach love story (‘Yucko’) develops among the carnage. “Twilight of the Cockroaches is a bizarre little animated allegory that is reputedly a satire in the Orwellian Animal Farm sense; instead, the film really succeeds […] as a metaphor on the wanton greediness of today’s younger generation. 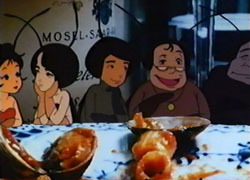 The film takes place mostly in the apartment of Mr. Saito (played by live actor Kaoru Kobayashi), a divorced bachelor who nonchalantly allows the cockroaches which inhabit his pad freedom of his domain. Like yuppies with an unlimited credit line, the greedy little insects live the high life gorging themselves on Mr. Saito’s leftovers.” “The movie’s scenes of cockroach slaughter are harrowing. As in Disney films where cuddly animals are served up as sympathetic, almost human-like protagonists before the onslaught of mankind (the forest scene in Bambi comes to mind), Twilight presents its roaches as fully dimensional and, well, with humanity. David Dubos, L.A. Village View, July 13-19, 1990, pg. ? David Chute, L.A. Weekly, July 13-19, 1990, pg. ? “Like the creatures of this video, Japanimation seems to be turning up everywhere. 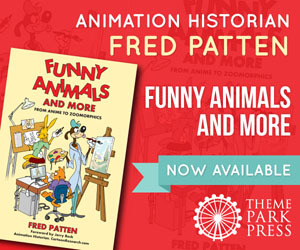 Once looked upon as curios, animated cartoons from the Far East now appeal to a broader market. 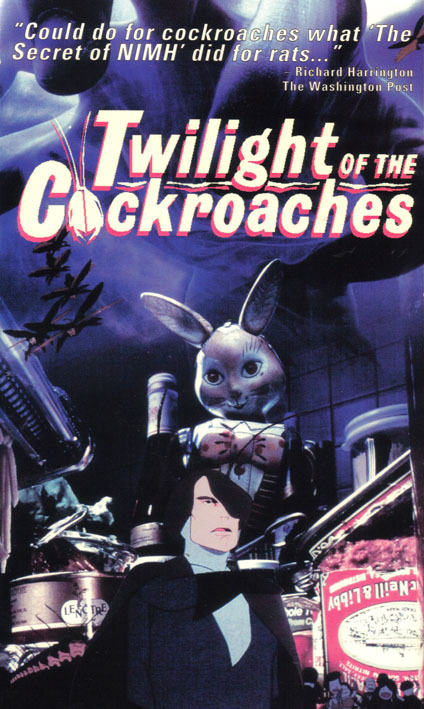 The shelves of mainstream video stores are stocked with titles like Akira, Robot Carnival and Twilight of the Cockroaches, which combines live action with animation. By a strange coincidence, I first saw Cockroaches just after rewatching Bambi, which made for a surprisingly appropriate double bill. Both animated features deal with such weighty issues as life and death and survival of the fittest.” “Humans-as-roaches is a striking, original concept. 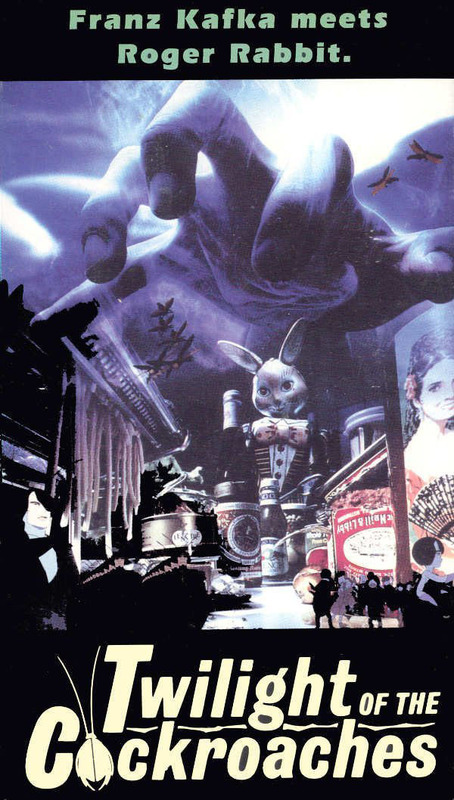 Except for Art Spiegelman’s landmark Holocaust parable, Maus, in which Jews and Nazis are replaced by mice and cats, I can’t think of a story quite like Twilight of the Cockroaches. The film has the good sense to poke fun at its basic absurdity, while never abandoning its premise. There are lines about ‘toilet roaches on the make,’ and Ichiro plays a roach variation of tennis while slurping on a mammoth bottle of Gatorade. 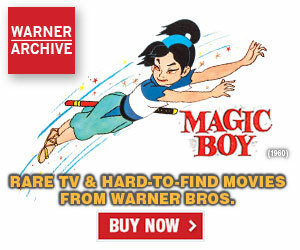 “Mavens call the technique ‘Japanimation,’ a startling overlay of cartoon imagery onto live-action sequences. 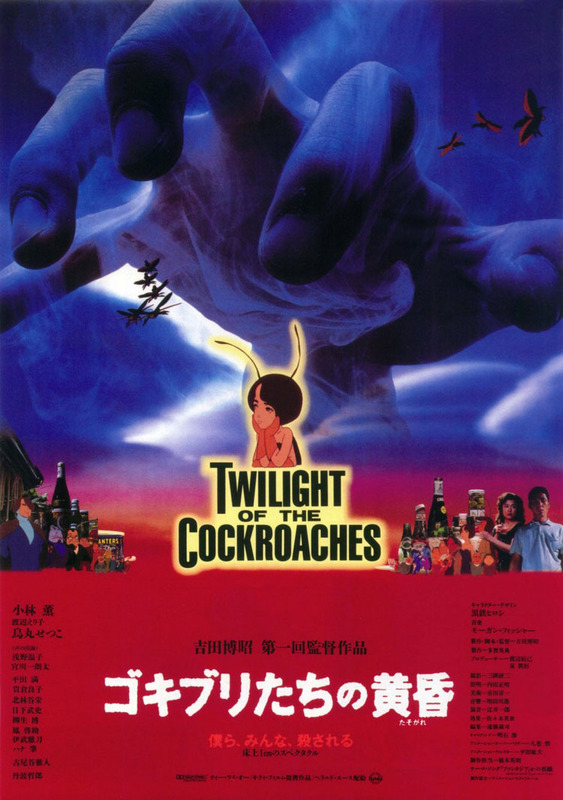 Nothing quite prepares you for its effect in Twilight of the Cockroaches, a seriously funny cartoon saga about an impending roach holocaust in a Tokyo apartment complex — as told from the bugs’ point of view. You’ve heard of underground movies? Well, this one’s a ground-level epic. In this uniquely witty film, written and directed by Hiroaki Yoshida, the animated roaches are heroes and the live-action humans are villains, wielding bug bombs the way madmen deploy those of the nuclear variety. Slated for extermination are dainty Naomi, a comely roachling in a blue strapless sheath and go-go boots; her handsome fiance, Ichiro, and Hans, the mysterious stranger to whom Naomi finds herself powerfully drawn. Naomi and Ichiro live in what he calls ‘up-market’ bliss. That is, in the apartment of Mr. Saito (Kaoru Kobayashi), a sloppy bachelor whose dirty dishes and messy flat are cockroach heaven.” “All this is shown from the roach’s perspective, and Saito looks like a sullen grotesque the size of a redwood. When he walks, it seems to Naomi that the earth moves. 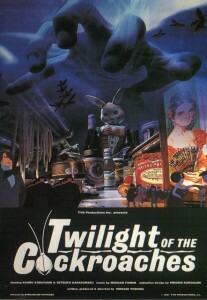 “As the funny and sweet allegory Twilight of the Cockroaches proves, Japanese animation is not all adolescent fetishes and techno violence.” “Yoshida blends the animated cockroaches with actual humans and sumptuous live-action footage, but Twilight’s exploratory points of view and imaginative use of backgrounds and brand-name objects blows away Roger Rabbit. From- the-floorboards shots and magnificent sound effects transform the humans into terrifying Godzillas wielding spray cans of death. Though clearly touched by the cryogenic spirit of Disney, the cute cockroaches are drawn with a softness and subtlely that breaks free of the Archie/Astro Boy look that’s still stamped on so many Japanese animated figures. 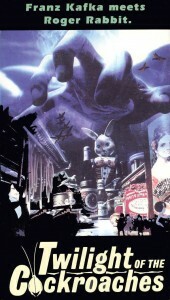 Though a remarkable, visually provocative big kids’ adventure story, Twilight’s allegory seems more paranoid than self-critical, and I’d prefer to resist decoding the exact identity of the humans, statements like ‘God chose the roach to inherit the earth,’ or the tribe’s obsession with race.” “One message I did groove with was the film’s final call to a new mutation, as it becomes clear that the only roaches who will survive the new war will be those who can physically withstand the poison. In a sense, all Japanese fantasy animation is a kind of homeopathic remedy for future shock, and maybe it’s only by boning up on this stuff now that we’ll be able to survive the onslaught of the 21st century. 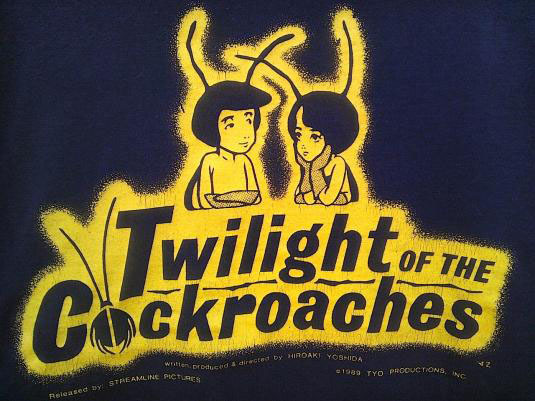 I think after MTV’s “Joe’s Apartment”, people often look back to this film as a precursor of that type of film, of course where Joe’s Apartment is played for laughs, Twilight of the Cockroaches is played very seriously as a cautionary tale on war and foreign invasion. Thinking about it again, what other film gives you a scene out of nowhere of a talking piece of excrement who gives our main heroine directions on where to go? I’ll just leave that here!